We hope this image brings a smile to your face. Although we fully understand that your situation is probably very frustrating, and we don't mean to minimize it, the image here reminds us that help is available and peace of mind is possible. We plan to keep you smiling with our fast, friendly, professional emergency roadside assistance service. The experience of hearing a car engine start to malfunction can be annoying, frustrating, and even scary. We'll do our best to help give you peace of mind during this challenging time. We'll be happy to take a look at the engine in your car or truck and see if we can get you back on the road. If need be, we can also give you a tow to the mechanic of your choice. Quick Tip - If you you blow out a tire on the highway, immediately put both hands on the wheel and take your foot off of the gas. Try to hold the wheel as steady as possible as you make gradual adjustments to get you car pulled of the road and onto the shoulder. Once you are safely pulled off the road, feel free to give us a call. We'll get your tire changed quickly and get you back on the road as soon as possible. It happens to the best of us. Almost everyone has tried pushing their car to the limit at least once. If you pushed a little too far and ran out of gas, give us a call. We'll be happy to fill up your empty tank with the correct grade of gasoline and get you back on the road as soon as possible. If you hear those sounds, you almost certainly have a dead battery or a battery too flat to get the car started. Give us a call and we'll be happy to jump start the dead battery. As a side note, if you hear a "machine gun" type sound when you try to start your car, your battery is probably okay, but there's another issue that's keeping your engine from starting. As another side note, if your car suddenly loses power while your driving, that most likely means that your alternator has malfunctioned. Whether it's your battery, your alternator, or something else, give us a call. We'll be happy to help! Don't be ashamed. We've all done it. If you've locked your keys in your car, just give us a call. We'll be happy to get you back into your vehicle, and we won't tell a soul. If your car has broken down on the highway, it is quite natural to be anxious. Whether or not you select us to provide you with roadside assistance, we’d like to at least help give you some peace of mind. Below you’ll find some tips for staying as safe and calm as possible while you wait for assistance. Ideally, it is recommended that you turn your hazard lights on as soon as you notice that your car having trouble with your car. This alerts drivers behind you that you will be slowing down to a speed that much slower than the posted speed limit, and can help prevent being rear-ended. However, we realize that you’re most likely reading this after you’ve pulled over and realize that you need assistance. It’s not too late to turn on your caution lights. Turning them helps you to be more visible, helping to prevent another motorist from colliding with you, and it also signals to police or towing companies that you need help. If your car works well enough that you can still drive it, try to get the car as far off of the road as possible on the shoulder nearest to your lane. If the car has stopped working completely and is sitting in a lane of traffic, we recommend that you look for the first safe chance to exit the vehicle and get out of the car. It is at serious risk for being struck by another driver. Assuming you were able to get your car to the shoulder, and weather conditions are suitable, we recommend that you exit your car on the side farthest from traffic. If traffic is passing on the left, for instance, exit out of the right side of the car. Stand at least 10 yards or so from the car. This helps ensure that if your vehicle is struck, you will not be injured. Once your far from the car, take a moment to think about how to open your hood and/or if you have a white rag or something else white that you can put on the hood or the antenna. When you have a plan for how to do those things quickly, wait for a gap in traffic, and try to open your hood and/or hang something white. This alerts passersby that you need help. When you’re outside the car again, think of what is the largest and/or brightest object you have in your car that you can easily lift. Again, when there’s a gap in the traffic in the lane closest to you, grab that object and place it about 25 meters behind your car. This will help warn drivers that your car is stationary and help prevent a collision. 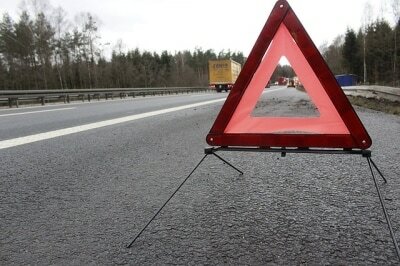 You should not try to perform any repairs on the car unless you are far from any lanes of traffic, you have at least a lane’s worth of space between your car and the nearest lane of traffic and you have placed a large and/or bright object about 25 yards behind your car. Also, for your safety, we recommend that you don’t attempt any repairs on your own unless the repair is very easy and you know how to do it quickly. Trying to work on your car even with all the precautions above can be dangerous. We do not recommend trying to flag down other drivers to get help, or even accepting help from other drivers. This puts both you and them in danger. They could be struck by another car while trying to help you. Also, you might be at risk of being hurt by a person with bad intentions, or who is driving under the influence of an intoxicant. Rather than seek help from a stranger, please give us a call. We’ll gladly come to help. 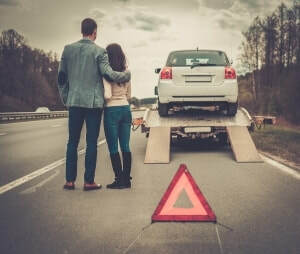 We have the appropriate tools to signal to other drivers that they should slow down or move over, and we have the expertise to know whether we can repair the car right there, or if the car needs to be towed to a repair shop. If you don’t call us, please call another reputable towing company (which may also be called a wrecker service). You’ll be much safer getting help from one of the local towing companies than from a random motorist. If your car starts to work again on its own, you’re able to get it running again, or we help you get it running, be sure to merge safely back onto the highway. Take a minute to see how far you can drive on the shoulder. If possible, you’ll want to get up to at least 45 mph before signaling and pulling back into a lane of moving traffic. If that’s not possible, we recommend leaving your hazard lights on. Then wait for a gap in the traffic and pull out with as much speed as you can. Leave your hazard lights on until your speed is within 10 miles per hour of the speed limit.